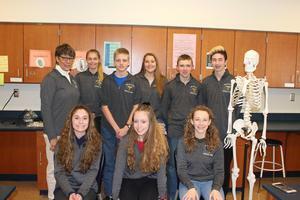 Students in the Project Lead the Way (PLTW) program at Penn Yan Academy have been recognized for their continued participation in the biomedical science courses. These students have completed the first course (Principal of Biomedical Science) and are currently enrolled in either Human Body Systems or Medical Interventions (course 2 and 3). Project Lead the Way provides students with the opportunity to participate in challenging academic courses. The biomedical courses focus on learning, exploring, and developing knowledge and skills that encourage students to pursue careers in various medical fields. Pictured are: (first row) Molly Pullen, Grace Worth and Leah Moniot (second row) Ms. Brenda Travis, Nicolette Pallar, Christian Reinard, Ashley Sisson, Kevin Smith and Nicholas Jarecke. Not pictured: Peyton Comfort and Logan Broome.